Sometimes when you put in the effort you get rewarded and that's how things turned out for Marine Hunter (KA Sails), who had to brave the train with her windsurfing sails from Paris to Marseille and then hunt for a board to borrow once there. Thankfully, her efforts paid off and she scored some classic Carro conditions. You can read her entire entertaining story of of the whole mission below as well as find a link to the video. Marine Hunter: “Hello and late happy New Year! I wanted to share with you my first video of the year (the first one in a while actually ^^) about a weekend in January well spent at Carro, the most famous wave spot of Marseille. However this time I chose to make the trip to South of France by train with my sails because driving such a long distance from Paris with my old car "only" for windsurfing is becoming more and more problematic for my conscience after all. I drive a lot all year round to chase after the waves of the English Channel and further away, I take the plane much more often since I began the PWA Wave Tour in 2017, and even though I carpool with other Parisian windsurfers and use public transports as much as I can, I decided to try a different means of transportation to get to the seaside this year when I could. The railway part was relatively easy and cheap thanks to Ouigo, a special low cost train company and I rented a car at Aix en Provence. The real issue was to find a board on site since mine wouldn't fit in without the ticket inspector nagging me. I was lucky enough to be able to count on: a high schooler I had never met before, my friends, friends of my friends and friends of my boyfriend. They all saved me when the local shop refused to rent me a board under the pretense that the conditions were "too dangerous" and that I might "lose the board" on the first day, with the mistral being rather northerly (cross-offshore) instead of blowing from the usual NW direction. I didn't try to argue since I know how you feel when you see a customer calling himself ‘a catamaran veteran’ coming back to the beach with a hole in the hull or a ripped spinnaker but I was fairly disappointed. Apart from this setback, I had a blast and scored perfect Carro conditions for three days. I had expected to sail on my 3.7 or 3.3 but instead was wobbling on 4.2 most of the time; the light winds enabled the unscathed swell to disclose the spot's full potential. I had never witnessed nor even imagined Carro like that before! 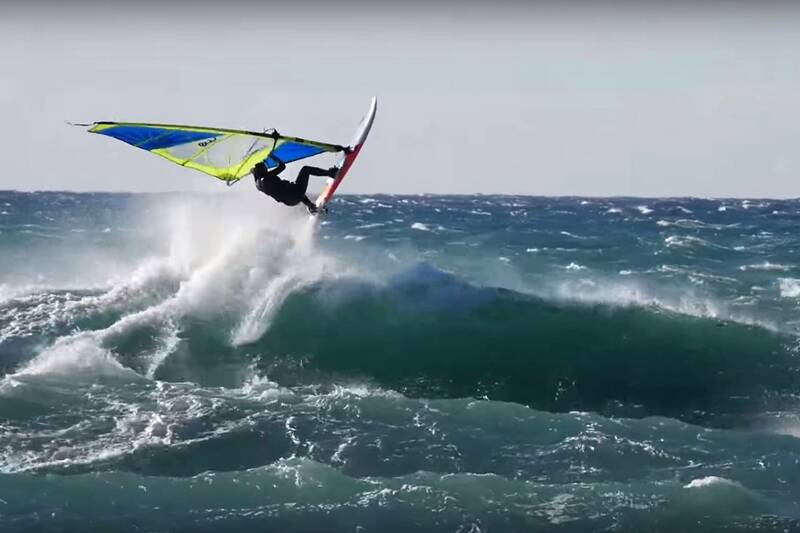 "Session of the year", told me the local devil Thomas Traversa (Tabou / GA Sails)! A generous Mediterranean Sea and generous people made this weekend truly special. I'm so grateful to all of them! Thank you very much for sharing this amazing memory!